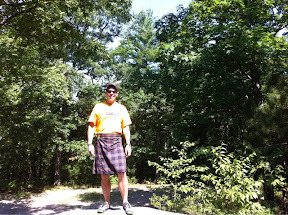 To jump right to the punch line, my hiking kilt is absolutely my favorite piece of clothing that I've worn this summer. The Sport Kilt Hiking Kilt is unique in the Sport Kilt line in that the material is microfiber. What that means is that it is extremely light weight and breathable which has proven to be great during the hot New England summer. 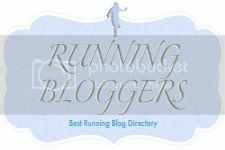 It is so lightweight that you might need to wear underwear on a windy day so take that into account if you are running in a family oriented race. Aside from that, it comes standard with a few features which add to the comfort and wearability. There's an elastic waistband which does a wonderful job of holding the kilt in place while still allowing you the breathe. There is a hidden pocket in the Velcro closing waistband that does a great job at holding my car keys. The Hiking Kilt also comes standard with sewn down pleats which means that the top 4 inches are sewn down. The result is a very slim fit over your hips. I know that sounded a little too Project Runway but I think it makes a hugely positive difference in the way it hangs. You can also get optional hidden poskets though my particular kilt doesn't have them. The rest of the construction is all kilt. An apron up front and pleats around the sides and back. I've washed the kilt about 3 times in the 1.5 months I've had it and it still looks great. A simple cold machine wash and air dry is all it takes. If the pleats lose their crispness, you can snap them back with a cool iron. Just be careful not to get the iron too hot since microfiber will melt. For the most part, I've worn this kilt for bumming around the house after work. 100000% the most comfortable article of clothing imaginable. Go #TeamNoPants! I'd estimate that 4 of 7 nights per week are spent lounging in this kilt. I wear it so much that my wife and kids are actually no longer phased by it and consider it a normal quirk of mine. progress! I've also worn the kilt around town on a few occasions to go grocery shopping or run a quick errand. I spent about an hour at the grocery store one Sunday morning with a huge stupid grin on my face because I was walking around basically naked and nobody could tell. It also makes a brilliant changing garment after a run. You can change right out in the open. I'll be honest here. It is been so freaking hot here this summer that I have not run in much of anything but my short shorts. Go #TeamBI3! On the few occasions that I've run in my kilt, I have been really pleased. It flows absolutely perfectly. Nothing binds or pulls. If you have ever imagined running naked, running in a Sport Kilt Hiking Kilt (in full on traditional style) is pretty close but you won't get arrested. The one minor drawback is that the waistband can get a little hot and sweaty since it's almost 2 inches wide. 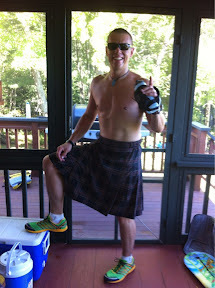 Conclusion: If you are comfortable with your manhood, give a Sport Kilt a try. I promise you will enjoy the Freedom! 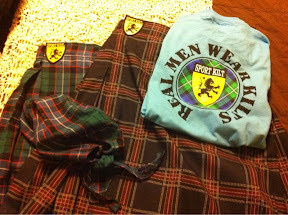 Note: Sport Kilt also makes kilts for women. Women in kilts are HOT! They make kilts for kids too but I couldn't really figure out how to include that in the prior statement without sounding creepy. Disclosure: my Hiking Kilt and also an Original Kilt were provided free of charge by Sport Kilt but I will definitely buy one in the future! Look for a review of the Original as soon as the weather cools down enough to wear it. I hike primarily in the west and have worn my Sport Kilt hiking kilt in the Arizona desert, Southern Utah canyons, Southern Coastal wilderness areas and most recently in Oregon. Sport Kilt's Hiker is the best thing to happen to hiking since Vibram-soled shoes. Glad to see that others are appreciating the benefits of hiking in the SK Hiker. It's a great product, for sure. Actually, I'm surprised other kilt makers haven't addressed the need for a lightweight hiking kilt. However, the overall perception of bitcoin sports betting is now a common and acceptable transit time in most societies. Are you searching for the best climbing GPS in 2018. You've gone to the opportune place, we've checked on various climbing gps, investigate our best climbing gps comparator and pick the one that meets the better for your requirements. The list goes on. In preseason training, or at the earliest playing stage,vambos.com these essential skills must be made known to our young players, and all efforts and time must be spent on mastering these basic skills.